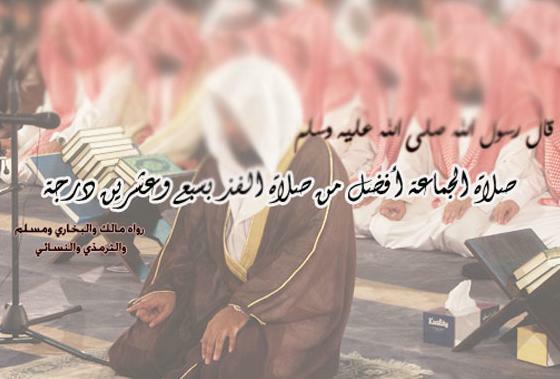 Al-Baghawi said: I heard Ubaidullah al-Qawariri say: I would not miss the Isha prayer (al-Atamah) in congregation. I was visited by a guest and I was busied with him. I went out seeking the prayer with the tribes of Basra but I found that the people had offered their prayers. I said to myself that it is reported from the Prophet (Allah bless him and give him peace) that he said: ‘The congregational prayer is more virtuous than the prayer offered alone by 20 degrees’ and it is reported ’25 degrees’ and ’27’. I returned back to my home and offered the Isha prayer 27 times and then slept and dreamt that I was with a group mounted on horses, I was mounted and we were racing, their horses were ahead of mine, and I struck my horse to catch up with them. The last of them (the group of riders in front of me) turned towards me and said: ‘Do not exert your horse as you will not catch up with us’. He replied: ‘Because we offered the Isha prayer in congregation’.